We, the Maruti Suzuki Employees Union (MSEU), Suzuki Powertrain India Employees Union (SPIEU) and Suzuki Motorcycle India Employees Union (SMIEU), have been on strike in our respective plants in Gurgaon-Manesar from the 7th of October, 2011, demanding our right to respectable and non-precarious employment and unionization. Our movement stands at a crucial juncture today, we therefore send this appeal to all the labouring people of the country and beyond, the trade unions and all other sections of society which have stood with us in solidarity to come forward with renewed vigour to take this movement forward. Our struggle is not a struggle for a mere wage-hike of any one section of workers, but is a struggle for our dignity and right to organise. We struggle also more importantly for the contract workers among us, whose insecurity and precarious condition of existence is a burning issue before the entire labouring people of the country today, which puts the very framing of the available labour laws into question. 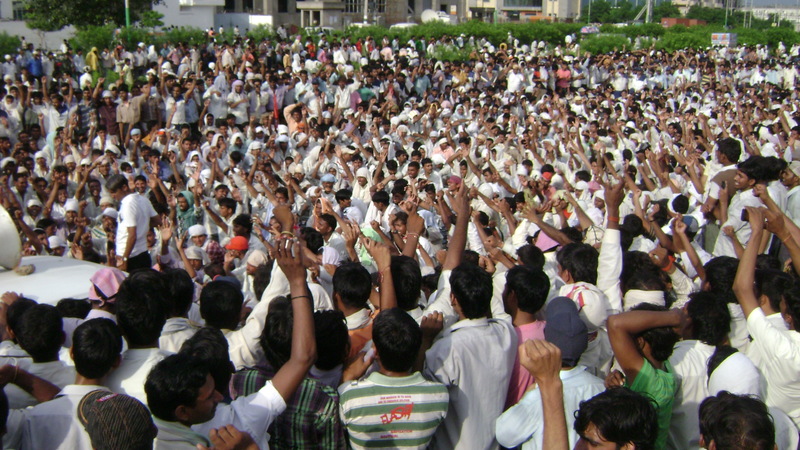 We, permanent and contract workers, have and do stand united in this struggle.To break our unity and resolve, the management of Maruti Suzuki India Ltd, Manesar is continuing to indulge in anti-worker activities and increasingly harass us with the absolute complicity of the state administration. The management began violating the terms of the last agreement from the very next day of our calling off the 33day long agitation continuing from August 29th till a settlement was reached on the 30th September. Going back on its word of treating the workers with respect, it has on the contrary been acting with vengeance, trying to create divisions among us. On the workers reporting for duty the day after the strike, the management flatly refused to let the over 1,200 contract workers enter the factory, so as to divide the unity between permanent and contract workers that this movement has achieved. It shuffled permanent workers from their workstations so that allegations of ‘production sabotage’ could be put on us. Such a shuffling of skilled workers, accustomed to and specialized at their specific tasks is far from being conducive to optimal production in the factory. Such a move therefore makes evident that fulfilling production targets are not a priority with the management at this point. Rather the point is to break our unity and resolve to struggle. The already inadequate bus service was also stopped to further harass us. Later contractors on the behest of the management used bouncers who threatened and attacked us recently in front of the factory gate on the morning of 7th Oct, this incident took a more blatant aspect when some goons came and beat us up at the factory gate on the 8th and threatened us for our lives. They even attempted to actualise their threat by coming with guns inside the Suzuki Motorcycle plant on the 9th morning and firing on our comrades there. All legal and illegal means have been used by the management to break our resolve and unity forged during the struggle in June and then again in August-September. The state and central government is acting hand-in-glove with the management. Earlier it merely gave us empty promises after the company broke the spirit of the settlement by acting in antiworker bad faith. Ever since we have been on strike due to circumstances created by the management, it has been issuing us show-cause notices instead of acting against the company which is habitually reneging on its promises and violating all labour laws, having turned all their instrument to implement justice to break our fight for a just cause. The number of police personnel, stationed in and out of the factory increased first to 1,500 and soon to 2,500. Having tried to push us into starvation by occupying the canteen and dismantling our set-up to cook food for those inside the factories, yesterday 14th October the management blocked our food and water supply and locked up the toilets. Given that it had no problem in arresting our leaders last month on false charges, the attacks on some of our fellow workers and the brutal lathi-charge on the workers of Honda in 2005, we also think that brutal repressive force could be used any time on us. With the company and the state acting together to control and oppress us, we feel the need to make a renewed appeal to all to extend and be part of our collective struggle. Since our struggle began, all workers, various Trade Unions and other sections of society have stood strongly by us. But now, the struggle in Maruti Suzuki has emerged as the concrete struggle of the around 8000 workers of the four plants of Suzuki group- Maruti Suzuki India Ltd., Suzuki Powertrain India Ltd., Suzuki Castings, Suzuki Motorcycle India Ltd. On 7th October, workers of another eight plants in IMT had also gone on a one day tool down strike in support. WE, Maruti Suzuki Employees Union (MSEU), Suzuki Powertrain India Employees Union(SPIEU) and Suzuki Motorcycle India Employees Union (SMIEU) continue to sit on strike at our factory gates. Our movement has been able to achieve an unprecedented unity among permanent and contract workers, local and migrant workers and workers of all our plants forged in course of struggle by the initiative of all struggling workers; this we consider to be our greatest strength and are resolved to take this strength forward. We shall not relent until our demands are met and all workers are taken back unconditionally. No degree of sacrifice can deter us from seeing this fight to the end. We appeal to all the workers and Trade Unions to extend concrete support in our struggle with both solidarity actions in their own factories, areas and before their own state governments and by contacting us and fighting this struggle with us. Even if a single worker sticks one poster on the wall facing an oppressive management, we consider it a concrete act of solidarity. The possibility that this strike and these solidarity actions are throwing up can lay the foundation of a new and more advanced phase of workers movement in our country, such that can compel each and every government and arrogant management to think many times before taking any antiworker measure in the future. In face of the brutal hand twisting of the workers sitting-in on strike in the Maruti Suzuki plant, by holding food and water ransom, we are now continuing our struggle outside our respective factory gates. It has now become evident that the Haryana administration is preparing for taking brutal and violent steps to smash our movement and disperse us from here. Such an assault will not just be on us but the right of all working people and we expect that would become the beginning of unprecedented protests in all corners and among all progressive sections of the country.